How do I implement Accelerated Mobile Pages (AMP) with Sitecore? This is just a general question. Has anyone implemented AMP with Sitecore before? Is it possible, how difficult and could you point me in the direction of documentation? 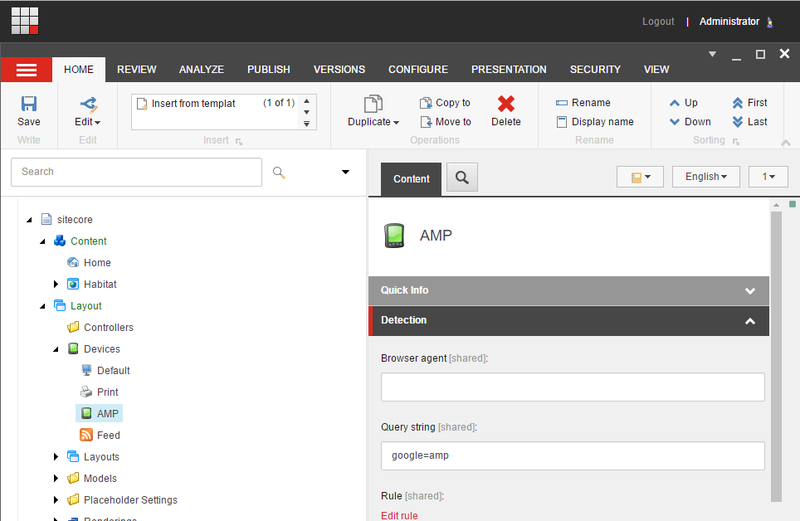 Because Sitecore supports server-side responsive rendering, it's very easy to use the Device feature of the CMS to support AMP. Assuming the page you're trying to AMP-ify is a fairly basic content page, we want to take the normal Rich Text field that represents the content of the page, and strip it of anything that AMP doesn't like. Disclaimer: This isn't heavily tested, but addresses the main AMP vs. HTML issues you're likely to encounter. You could also probably get fancy and use agent detection, but I don't think there's a dedicated AMP agent, so it's important to have a way to explicitly differentiate between your default output and your AMP output. Querystrings are your friend. 2: Create a meta tag in your Default Device Layout that references your AMP Device layout for the context Item. Keep in mind that although you could AMP-ify your entire website, it's only supposed to be for newsy-article kind of stuff. Don't expect to be able to include tons of anciliary content, cross-sells or calls to action. This is mostly about goodwill content for mobile users. mvc.renderRendering to extend the standard Vary By Param cache option to support AMP view. Please find the exact implementation on GitHub. Not the answer you're looking for? Browse other questions tagged best-practices presentation mvc or ask your own question. What's an efficient Frontend development process / workflow for Sitecore? Posting a single form with multiple buttons in a Sitecore page. Is it possible? How can I append HTML within and before the text of a rendered Link Field?